We really do have to nicest, most interesting, well-rounded co-workers here at Third Place Books. Greg, who shelves the history section, is our go-to-guy for all things Everyman's Library. Greg is an Everyman aficionado, and has almost 300 titles in his collection! Crazy! He also keeps a current listing of the Everyman titles on his website, and his little corner of the world wide web gets quite a lot of traffic. Greg says that you would be pretty hard pressed to find another more, concise, complete listing of the Everyman titles out there. Even the Everyman homepage lacks a complete listing. For shame! "Anyone who handles old books will have come across these small and sometimes beautiful labels pasted discreetly (more or less) into the endpapers. 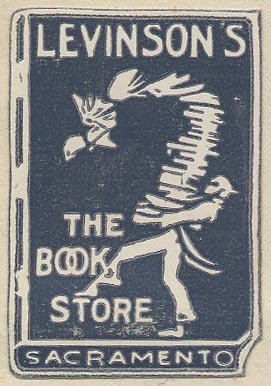 Booksellers, binders, printers, publishers, importers, and distributors of books used to advertise in this way their part in bringing the book to market. Most of the earliest examples shown here belong to binders (e.g., the Marcus Ward ticket, ca.1841); these were a continuation of binders' earlier practice of sewing into the binding a small ticket with their signature. "This collection began with labels found in our own books, but now it is mainly a virtual collection -- each entry is digitally scanned from books found in the excellent research library to which we repair in our spare time. We must admit to having gone from "coming across" the labels in our book-browsing to actually searching for them. Contributors from around the world have added a wonderful diversity to the collection." Check out his fabulous website and marvel not only at the little scraps of beauty that Greg has searched out and cataloged, but also at his amazing organizational skills. My particular favorites are the animal and ship labels. Bravo, Greg!